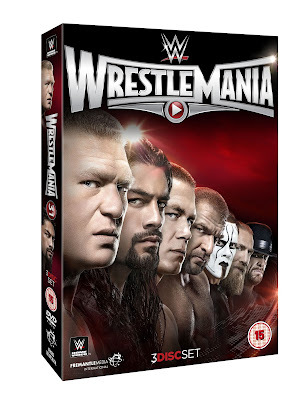 WWE WrestleMania 31 is out on DVD and Blu-Ray now, available from www.wwedvd.co.uk Broadcast live on Pay-per-View (and the WWE Network) from the Levi's Stadium in Santa Clara, California, USA on 29th March 2015, the three-disc set features Roman Reigns challenging Brock Lesnar for the WWE World Heavyweight Championship, alongside appearances from The Undertaker, Daniel Bryan, Sting, Seth Rollins, Dean Ambrose and many more. The special features include two matches from the WrestleMania Kick-Off show and the 2015 Hall of Fame ceremony in full. A fun, spot-laden ladder match for the Intercontinental Championship, involving the likes of Daniel Bryan and Dean Ambrose, kick-off the show in good fashion. The crowd is loud from the out-set, making this a great match to open the show, with a feel-good finish making things even better. Randy Orton and Seth Rollins' grudge bout is an underrated scrap with the pair working together nicely on a series of strong reversal sequences. A spectacular finish caps off a throughly enjoyable contest. Whilst it may not be a great wrestling match, Sting and Triple H's No Countout, No Disqualification bout is a great spectacle. From the entrances onwards (especially Triple H's) this is fun and slightly ridiculous contest, that may be the epitome of sports-entertainment. Choc-full of nostalgia, any fan of the Monday Night Wars would get a big kick out of this one, although younger fans may get a little lost in it all. A musical performance from Skylar Grey, Kid Ink and Travis Barker is not the worst musical interlude in WWE history, but perhaps could have been cut from the DVD release. Paige teams with AJ Lee to take on the Bella Twins in a completely watch-able Diva's effort, with a nice story. John Cena and Rusev's Fastlane rematch fails to reach the heights of their previous match, but is still a good slice of action. Based heavily on the pairs submission holds, there's a solid story to be told here, with Rusev's relationship with manager, Lana, also playing a part throughout. The main draw back to this one is the crowd's lack of interest in the contest, which may be down to many international fans in the crowd, not buying into the USA vs. Russia storyline. An appearance from Ronda Rousey (UFC/The Expendables 3/Furious 7/Entourage) works well for what it is, with The Rock, Stephanie McMahon and Triple H all involved also. As cool as it is to see Ronda on WWE television, it's Stephanie who steals the segment with some superb work on the microphone, especially opposite Rock. The return of The Undertaker produces a decent encounter opposite Bray Wyatt, in what is a bout driven by character. It's a shame that this bout wasn't held in darkness, as the level of light, takes away a little from the mystique of the characters, especially during the entrances. Whilst the match feels a little formulaic, the crowd is into every near falls, which certainly helps. Whilst it would be easy to cast away the Roman Reigns vs. Brock Lesnar World Heavyweight Championship main event, due to the excitement of the finish, the two put on a terrific, hard-hitting bout. With Reigns out to prove that he was worthy of his spot in the main event, the 29 year old puts on a great performance, with his facial expressions bringing a lot to the story of the bout. A fantastic piece of booking, that allows every man involved to shine throughout, there's a reason why this bout won ATPW's Match of the Month poll in March. The special features begins with two bout's from the WrestleMania Kick-Off show, starting with a lively four-way bout for Tyson Kidd and Cesaro's Tag Team Championships. With the crowd warming up nicely throughout, thanks to the multitude of well-timed spots, this bout is a lot of fun to watch. The Andre the Giant Memorial Battle Royal, including the likes of Cesaro, Hideo Itami and Kane, is fun battle royal, despite the match lacking on any real star power. Damien Sandow and The Miz's storyline is furthered nicely throughout the bout, that includes some cool elimination spots. The Uso's begin the Hall of Fame ceremony with a slick and humours speech, as they induct their Father, Rikishi. Rikishi's speech is well-delivered, with a strong focus on his family, as it to be expected for a member of Anoa'i tribe. Anyone looking for some stories about Rikishi's time in WWE (especially during the Attitude Era) may be a little disappointed, as the speech rarely ventures into that area. With a strange combination of kayfabe and real-life stories, the content of Bruno Sammartino's induction speech for Larry Zybysko, is interesting in-terms of content, it's a shame that the delivery is dull as dishwater. In contrast, Zybyszko's speech is charismatic and engaging, with a handful of great stories about his time in the business. It's a shame however that Zybyszko hasn't planned any of it, leading to a number of repeats and the speech descending into a complete car crash come the end. Alundra Blayze's acceptance speech works as an extended list of people she has met throughout her year's in the business, which has it's moments. The gimmick at the end, in which Blayze's reenacts her infamous appearance on Monday Nitro, is about as cringey as could be. The Ultimate Warrior's widow, Dana, produces a speech, that is both heartbreaking and fantastic in equal measure. As Daniel Bryan presents the late Conor the Crusher with the Warrior award, the former World Heavyweight Champion's speech is emotional, but focuses on the lighter times he spent with Conor. Conor's Dad, Steve, put's on stellar job, under the circumstances, and Conor's brother's final words would be enough to bring even manliest of manly man to tears. The Bushwacker's acceptance speech is just as absurd as you'd want it to be, with the pair seemingly completely off their collective rockers. They do, however, manage to produce some quite interesting stories about getting into the business, in what is perhaps the surprise gem of the Hall of Fame ceremony. Hulk Hogan's induction speech for Randy Savage fails to hit the mark, with the pairs difference at the time's of Savage's death quickly becoming the elephant in the room. Savage's brother Lanny Poffo's acceptance speech focuses more on Savage's relationship with the Special Olympics, rather than Savage's time in the business, and also shuns Savage's first wife Ms. Elizabeth. Triple H works as a strong inductor for Arnold Schwarzenegger, with The Game putting together a slick and funny intro for the Hollywood star. Schwarzenegger (Conan the Barbarian/The Terminator/Commando/The Running Man/Predator/Twins/Total Recall/Kindergarten Cop/True Lies) puts on one of the best celebrity inductee speeches to date, with a strong focus on his relationship with wrestling over the years. Shawn Michaels has charisma coming out of his arse, as he talks about his old pal, Kevin Nash, with some great personal stories surrounding major moments in Nash's career. Big Daddy Cool's acceptance speech works nicely as a close to the show, with the crowd lapping it up, before inevitable appearance from the Klique. John Cena prepares for Rusev is an interesting interview between Cena and Byron Saxton, with a handful of added clips to illustrate the points made. Seth Rollins is the Future is a similar venture, with Booker T, and whilst the feature is well produced, it's placing at the end of Disc Three is curious indeed. One of the best WrestleMania's in recent memory, there isn't a bad match on the main card here. The Hall of Fame ceremony is a mixed bag as ever, but there's still plenty to enjoy here, especially with the help of the skip button. Throw into the mix two decent matches from the Kick-Off show that are both worth a watch and you have a DVD that is well worth the money.